The d1-twelve-mk2 is an improved version of the former d1-twelve(-SE) DAC, using also new technics from the d1-direct and d1-seven DACs. This DAC is composed of two monoblocs and a specialized reclocker, so it is a 3 box system. The d1-twelve-mk2 uses 6 discrete resistor R2R ladders per channel, so a total of 12 ladders for the system and in other words roughly 600 Vishay Foil resistors, probably unique in the world. 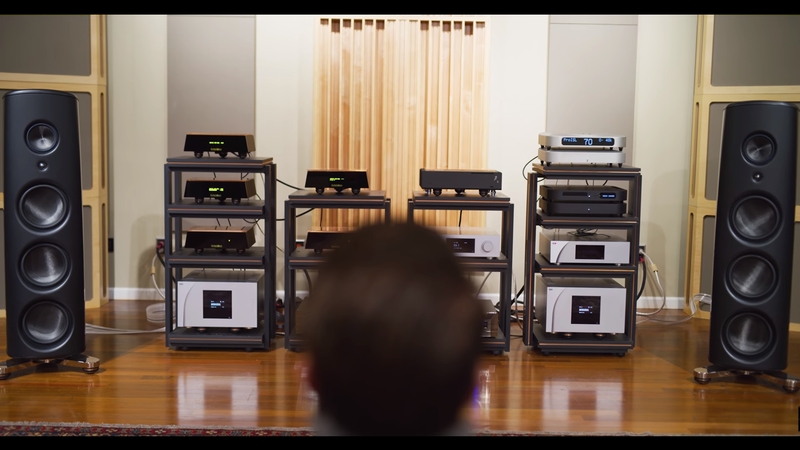 So many DACs in parallel allow to lower the noise and the impedance, so much that an output stage is not mandatory. -one set of unbalanced RCA and XLR outputs which are directly connected to the R2R ladders, without use of active output stage. So there is no tube nor transistor nor any other active components in these outputs for the maximum transparancy. Also no feedback at all. -one set of RCA and balanced XLR outputs using a discrete transistor class A output stage. These outputs have a higher voltage to match all (pre)amplifiers. The d1-twelve-mk2 has been designed for the most resolving speakers, so the most difficult to satisfy, to get the largest amount of information and at the same time a sweetness never heard before. 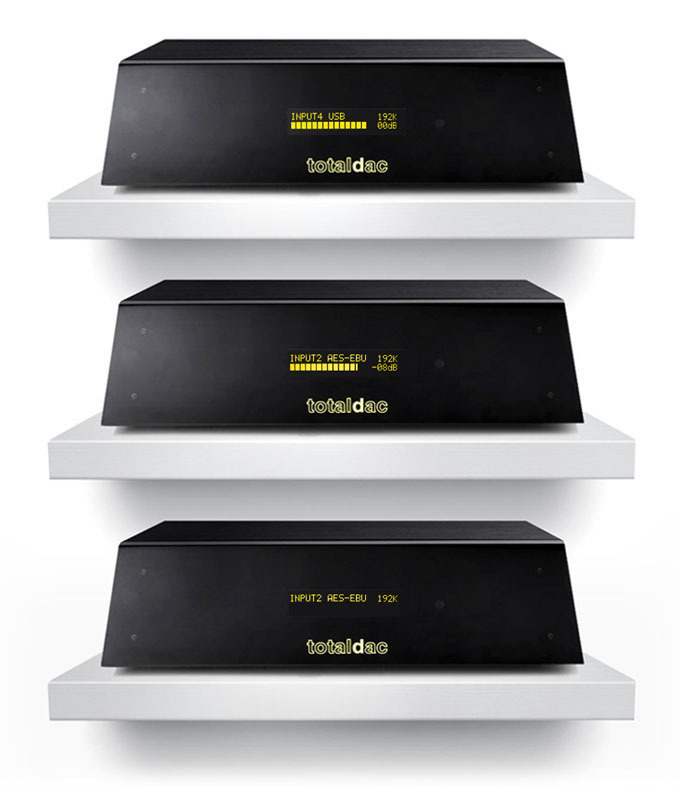 "The Totaldac d1-digital reclocker/d1-twelve DAC combo represents a MAJOR ACHIEVEMENT in the world of digital converters. It shows performance levels that go beyond everything that I have ever tried under known conditions. The most striking virtue was how it brought together extreme transparency and exemplary musicality without sacrificing one bit of either of the two. "Here and now sound of French DAC speaks to me, to my whole ME, to my whole music universe. It brings a new way of feeling the music, taking off “something” that other digital systems tend to add. Frequency response is very wide, however we do not necessary see it like this. It is because we talk not about magician tricks but real, solid way of bringing music that only analog master-tapes can do. It is outstanding digital system, one of the very best I know of. -192KHz asynchronous Xmos USB, optical, RCA and AES-EBU digital inputs, selected from a remote control. -44.1KHz, 48KHz, 88.2KHz, 96KHz, 176.4KHz and 192KHz, 16 to 24 bit formats supported. -as an option, DSD (DoP standard) supported on all inputs. -embedded custom clock with anti-jitter FIFO memory. -1.6Vrms max at the R2R direct unbalanced RCA and XLR ouputs. -3.2Vrms max at the RCA output with active output stage, 6.4Vrms max at the balanced XLR output with active output stage. -volume control, adjusted by a remote control and an OLED display, works for all inputs, not only USB. -phase polarity selected by remote control. -non-oversampling DAC compensation filter activated or disactivated by remote control. -display switched off by remote control or automatic. -R2R DAC technology using about 600 pieces of 0.01% VAR Bulk Metal® Foil resistors Vishay Foil Resistors. -direct R2R ladder outputs or class A discrete transistor output stage, selected by a switch at the back panel of the DAC. -two AES-EBU cables (included) connect the digital front end to the monoblocs. -external power supply to minimize the noise. -aluminium and PMMA enclosure with massive pure copper antivibration plate. -DAC dimensions: height 110mm, width 360mm, depth 290mm. -power supply dimensions: height 65mm, width 122mm, depth 180mm. -streamer option. The software is the same as the d1-streamer, RoonReady certified. -BNC coaxial digital input instead of RCA. -dedicated power supply for streamer board. The noise floor is extremely low, almost at the limit of the measurement equipment used.